A Thali is a platter that is made up of several different dishes to create a perfectly balanced meal. In the Hindi language, the word ‘thali’ means ‘the plate’. 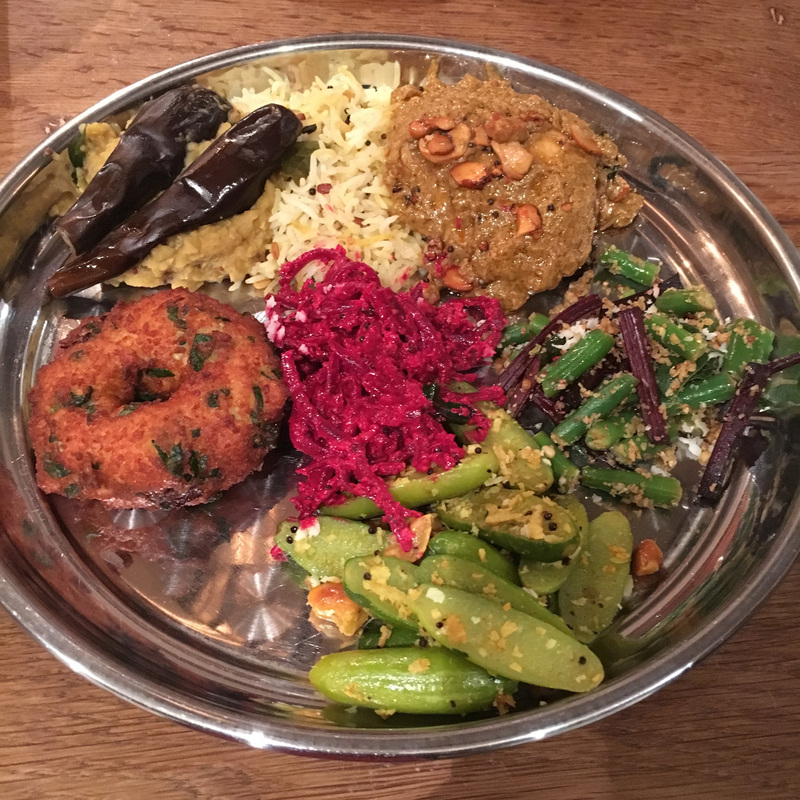 Traditionally, a thali comprises of a large metal tray hosting 4-6 smaller metal bowls. Each bowl contains a different dish, from vegetables and lentils to raita. Alternatively, a thali can also be comprised of different compartments on a steel tray. It is believed that the thali originally comes from South India, where a selection of different dishes was traditionally served on a banana leaf. In a traditional thali, the different curries and sauces are placed around the sides with a heap of rice positioned in the centre. Each of the curries and sauces is mixed with the rice one at a time and eaten in a specific order. The idea behind a thali is to provide a good, wholesome meal. In India, we believe that we have six distinct tastes: sweet, salt, bitter, sour, spicy and astringent. Each individual curry should represent one of the six distinct tastes so that the meal is totally balanced. As well as being balanced in terms of taste, I think that this way of eating also helps to ensure that the meal is balanced from a nutritional perspective as well. With a thali, each of the food groups is always presented (carbohydrates, protein, milk and dairy, fruit and veg, fats and sugars). It’s a far cry from how curries are eaten in the UK, usually by heaping a huge portion of curry over your rice. Eating a thali has a much more delicate process, with finesse and a certain style. In the South, you are usually given a banana leaf that you wash with a little sprinkling of water before laying it on a table. In general, the thalis in the south are vegetarian, but you can also get meat and fish versions as well. Usually, three vegetable curries (dry and saucy) are placed directly on the leaf, while the sauces are positioned in small bowls (usually a sambar, vithal kozhambu, rasam, curd and sometimes a sweet payasam). There is usually a poppadum as well, which is eaten at the end. The main rice component is heaped into the middle of the leaf. The rice is then divided into portions and eaten with each of the dishes. Usually, a well is made in the rice and the curry poured in to be mixed with the rice. There is an etiquette as to which dish follows which, but this can vary from region to region. First, the vegetable curries are eaten. These are usually a wet and a dry ‘thoran’ of some variety. Next, the sambar (a watery lentil and vegetable soup) is mixed with the rice and eaten. Next, the vithal kozhambu is served. However, as this is the spiciest dish, it’s not always served. Next, comes the rasam, which is a peppery tomato soup. The meal is usually finished by mixing the curd and rice together as this has a cooling effect on the body and helps with digestion. Payasam is normally eaten separately as it’s a South Indian rice pudding. Meals can be finished with this for the final sweet ending. Another very important point to mention is that in India the thali would always be eaten by hand. Indians believe that eating is a sensual activity and that using hands elevates the sensation and flavours of the food. In a practical way, the fingers also help to gauge the temperature of the food. Normally, you would only ever use one hand to eat with, leaving the other clean to pick up drinks. Once you have finished your meal, it’s custom to fold your used leaf. I believe that the correct etiquette is to fold the leaf towards you to signal that you liked the food, but to fold it away from you when you didn’t enjoy the food. If you can’t remember what to do, then just leave it open and leave with a smile. Thali’s from other regions of India will serve a variety of different. I don’t think that there any right or wrongs when it comes to what to serve in your thali, so long as it’s an array of different styles of dishes that will look appealing and colourful. The Punjabi Thali would include some form of bread (roti, naan or paratha) and a mixture of meat and vegetable dishes. Both dhal and paneer dishes are likely to feature, as well as a salad of red onions and green chillies. A Bengali Thali would most definitely include some form of fish curry. Those of you who know me know that I have no problem packing away a meal big enough for two weightlifters, so coming up with my ultimate thali has been a bit of a challenge. I mean, it’s hard enough going to a restaurant and choosing from a menu – such an impossible task! But, after much deliberation, this is my Ultimate Indian Thali. I warn you now, some dishes are a bit out-of-the-ordinary and very Punjabi in style. Roti – Wheat is the main staple of the north of India, and unlike the South, I just can’t have a thali without roti – it would be like battered cod without chips! Tandoori Chicken – Every Punjabi Thali must have something from the tandoor and a smokey chicken drumstick would do it for me every time! Thari Walee Lamb – A slow cooked lamb or mutton dish is perfection, especially when the meat just melts in your mouth. It would have to have a wonderfully rich sauce that I can scoop up with my roti. Masoori Di Dhal – Red lentil dhal is light and fresh. It’s my favourite dhal both because of the taste and colour. The sunshine yellow really brightens up the thali! Stuffed Punjabi-Style Karela – Known as bitter gourds, these are certainly an acquired taste, but I love them. They are usually stuffed with a dry spiced masala and slowly pan-fried. With a wonderful, bitter aftertaste, they are unique, but cooked correctly (and sometimes with a little tangy amchoor) they are heavenly. Plus, they work so well with the red lentil dhal. Cucumber Yoghurt – Yoghurt is always cooling and refreshing, but add cucumber and it creates a lovely extra texture that makes the yoghurt really yummy. I also like to add some chilli, garam masala and salt to balance it out. Onions and Chilli Salad or Kachumber – I always want an onion salad and an extra chilli, just in case. The onions give a crisp bite and there is just nothing better than a fresh green chilli to turn the heat up a notch. Lime Pickle – In my mind, no thali is complete without the tang of a pickle or chutney. Sometimes, I might opt for mint chutney, but there should be something that gives that acidic taste. Cumin and Pea Rice – Ordinarily, I would just opt for roti instead of rice. However, if I were to have rice then I would fry some whole cumin seeds to add a wonderful fragrance. The peas are then like little sweet emeralds tucked away in the rice. Overall, this is a simple but lovely way to serve rice.